What makes a safe holster, safe? What makes a dangerous holster, dangerous? What’s the difference between a “good” holster and a “bad” one? The answers I received were interesting and enlightening. Although there was a lot of vigorous debate about the specifics, there was also a surprising degree of agreement about the basics. Most people agreed that a safe holster does several important things, while an unsafe holster either fails to do one of these things, or does so in a way that encourages the user to violate the rules of safe gun handling. The key to evaluating holster safety is to first understand the purpose of a holster. What is a holster designed to do? Why do we use them? Once we’ve understood the holster’s purpose, understanding the elements that create a safe or an unsafe design becomes a lot easier. 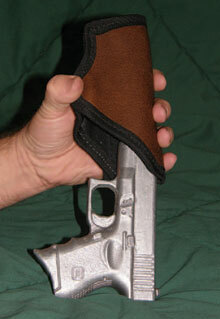 First and foremost, the holster serves to keep the firearm safely secured. The specific way it does this will vary from holster to holster or from carry system to carry system, so don’t get too hung up on specific design features. Focus instead on the primary goal: to keep the firearm safely secured. Ideally, once the firearm is placed within the holster or carry system, there should be no way for the firearm to unexpectedly discharge—whether by the user’s wayward finger or by external happenstance. With modern firearms, this means that the trigger and the entire trigger guard area must be completely covered. It also means that the material which covers the trigger must be sturdy enough to prevent any outside activity from moving it unexpectedly. This is true no matter which type of carry system is used. If the gun is carried in a pocket, the trigger must be protected from external movement just as surely as it would be if it were carried in a belt holster. If it is placed within a purse, the trigger must remain as protected as if it were in an ankle holster. Allowing the firearm to float around loosely within an oversized compartment, with trigger uncovered and vulnerable to pressure from keys, pens, coins, and other detritus, is simply asking for trouble. The safest carry methods allow the firearm to ride in stately isolation, inside something sturdy enough to prevent any external pressure from reaching the trigger, and which reliably holds the firearm in a predictable orientation. That way, it will always be there when we need it. With the trigger covered or otherwise protected from external influences, we know that the firearm will remain a safe and inert object as long as it remains within the holster. But how do we know that the gun will remain within the holster until such time as we deliberately take it out? Tip test: using a three-times-checked unloaded gun or (better) a dummy gun, gently tip the holster upside down over a soft surface and give it a shake. If the gun falls out, throw the holster away. For standard belt holsters, one simple test of whether the holster meets this design requirement is the tip test. To perform this test, take an unloaded gun, a dummy gun, or a gun that has been disabled with a training barrel or barrel block device. Check to be sure it is unloaded, and unload if necessary. Remove all ammunition from the room and check the gun again to be sure it is still unloaded. Then place the unloaded gun into the holster, securing any straps or retention devices, and hold the holster a few inches above a soft surface such as a couch or bed. Slowly tip the holster upside down and shake gently. Does the gun fall out or does it stay where it should? If the gun falls out of the holster when the holster is tipped upside down and gently shaken, that holster does not meet this primary holster purpose of holding the gun securely. Obviously, not every carry method can be checked with the simple tip test. But for most on-body carry methods, it is a good place to start. Does the firearm remain securely in place or is it working its way out of your holster or carry system? Remember, in many situations where activity dislodges the firearm, you won’t be able to put a steadying hand on the gun to prevent it from working its way completely out and falling to the ground. If your holster or carry system does not keep the gun where it should be with no extra help from you, it fails this test. For those who read the paragraph just before this one and shook their heads, figuring that they would never be all that active anyway, remember that children and grandchildren often expect their adult cohorts to play with them, to bend over to comfort them, to reach down and help untie the knotted shoelace. Even an ordinarily sedentary person might be coaxed into a short but vigorous sprint when the family dog is headed toward the street, or when scurrying to catch up with a young family member toddling toward danger. And finally, if a criminal grabs you from behind, will you remain in a calmly upright position, or would you perhaps become a little more active in your quest to free yourself and access your firearm? For these reasons and many more, holsters must be designed to hold their firearms securely in place. Although many holsters are designed for open carry on the range or in the field, our subject here is concealed carry. Toward that end, the holster should help us keep the gun hidden from prying eyes. An uncomfortable holster tempts the user to frequently readjust, drawing unwanted attention and destroying concealability. There are two basic ways that a holster can meet this design requirement. First, the holster can be designed to ride underneath the clothing so closely against the body that it becomes literally invisible to others. Belt holsters may feature strategically-placed belt loops to help bring the gun more tightly to the waist; they may be designed to allow the user to tuck a shirt over the top of the grip; they may be designed to cant the gun or to ride slightly higher on the beltline so that the cover garment needn’t be overly long. 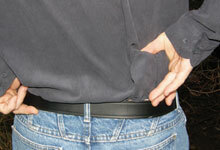 Together with sensible clothing choices, such holsters remain invisible and keep firearms invisible to others. The other way a holster or carry system might keep the gun concealed is to make the carry system functionally invisible through effective urban camouflage. For example, a purse or waist pack must always remain readily visible to the general public. However, if the purse is well-designed to conceal a pistol compartment, or if the waist pack effectively matches the circumstances in which it is carried, others’ eyes slide right on past without truly seeing what they are looking at. The gun concealed within the purse or pack remains undetected even though the carry method remains within plain sight. When we choose a holster or carry method which is uncomfortable, concealment becomes more difficult or even outright impossible. That’s because it is only human nature to fidget or scratch, to fiddle with the thing that’s making us uncomfortable—and every time the user’s hand is drawn to the firearm, others’ eyes are drawn right along with it. Furthermore, if the carry method is uncomfortable enough, the gun will be left at home despite our best intentions. For this reason, comfortable concealment is a crucial aspect of holster or carry system design. When shopping for a new holster, most of us ask ourselves, “How well can I carry and conceal my firearm with this holster?” That is indeed a crucial question, but too often, that is where we stop. As soon as we have found a holster which allows us to comfortably tote the gun around with us, we’re satisfied. This makes good sense because, after all, carrying and concealing the firearm is our everyday experience. If the carry rig is uncomfortable or poorly concealed, we notice it and take pains to correct it. But I submit to you that the answer to another question is perhaps even more crucial, and far too often overlooked in our quest for the most comfortably concealed holster possible. That crucial question is, “How well can I access and use my firearm with this holster?” After all, an otherwise-excellent holster which securely holds the firearm in place, fits comfortably, and allows the user to easily conceal the whole package wouldn’t be excellent at all if the gun were not actually accessible to the user in a moment of need. While it is true that trade-offs will nearly always be present, that doesn’t mean they’re not trade-offs. In search of the perfect, comfortable carry method, people tend to forget that the whole reason they’re putting up with that lumpy, heavy, uncomfortable bulge in the first place is so they can use it if necessary. If you’ve compromised on carry methods or equipment to the point where the gun is no longer readily accessible, to where you cannot realistically practice with the setup you actually use, to where drawing the gun involves bodily contortions worthy of a Houdini and requires more time than it takes for the cops to arrive, you might as well get that troublesome lump off your body and leave it in the safe. If you’ve compromised to the point where the gun you carry has shrunk to little more than a piece of jewelry, a miniature talisman against evil which has little effective power and which is too tiny to practice with, you might as well sprinkle fairy dust on your shoulders to ward off criminals instead. To test for ready accessibility, unload the gun as previously described. Enlist the help of a friend. Pick a safe direction—one that would definitely stop a bullet—to point the firearm while drawing. Clap your hands together (this forces you into a good starting position) and then draw your gun. When you friend hears the handclap, have him start counting one-one-thousand, two-one-thousand; your draw should be completed before two seconds are up. You should be able to do this from both standing and seated, wearing the clothing you ordinarily wear, with your carry rig set up as you ordinarily wear it. No cheating! The purpose of the holster is to keep a functionally effective firearm readily available for instant use. Any holster or carry rig which fails to meet this basic purpose is a poor one. Getting right down to the bare essentials, the purpose of a holster is to safely secure the firearm, to comfortably conceal the firearm, and to keep the firearm readily accessible for rapid use. Any holster or carry system which meets these requirements is a good one. Those that fall short on any one of these crucial considerations should be avoided.